The schedule bar chart is a key to your team. 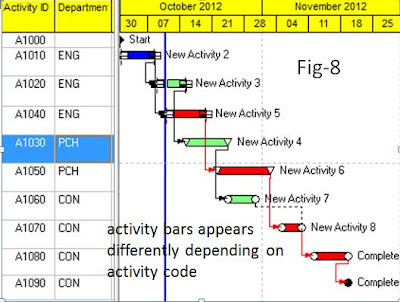 Creating a user-friendly schedule layout that is readable and easily understandable for the users is one of the main tasks of planning, scheduling and project controls professionals. 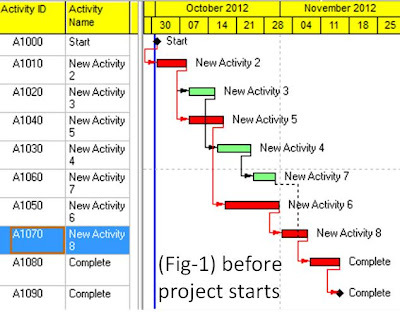 Hundreds of layout can be made depending on recipients’ requirements by changing appearance of schedule bar chart. You may wish to highlight the significant activities for your team or show some activities to stand out among the busiest activities by customizing bar chart appearance. 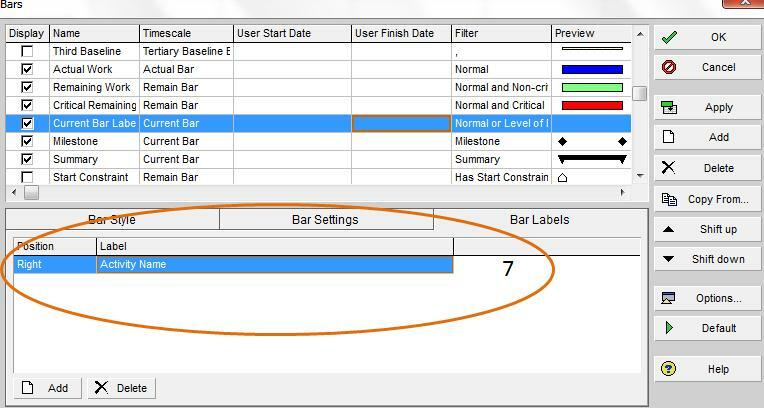 Changing of bar chart appearance is only made by the bar dialog box and filters. It is the art of changing and customizing bar style, bar color and filter list. Three things you need to know about the bar chart in order to be mastering in schedule layouts. Understanding how the existing bars works before changing anything is essential. Below is a snapshot bar chart from one of the Primavera P6 default layout. To find out go to View under menu bar, select Bars…. 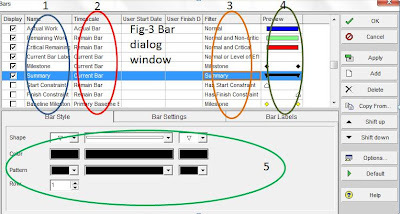 Below are the snapshots of Bars dialog window and their functions. 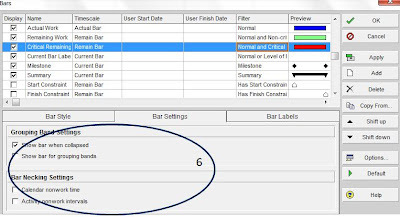 (1) Name Column where bar chart description or bar labels are and also known as bar legend. It can be changed as you desired. 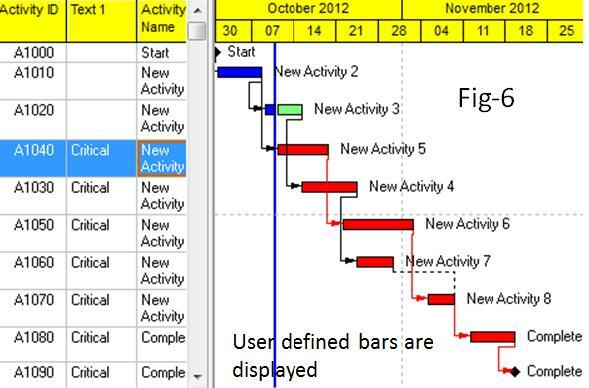 (2) Time scale column where a drop down list of the time scaled bars are. It cannot be changed or modified. For instance, select Actual Bar from the dropdown list if you want to indicate the actual works when project is progressed. (3) Filter column where the desired filter criteria are used. (4) Preview Colum where the preview of bar style and color is displayed when bar style format is changed. (5) Bar Style where the bar style and color can be changed as desired. 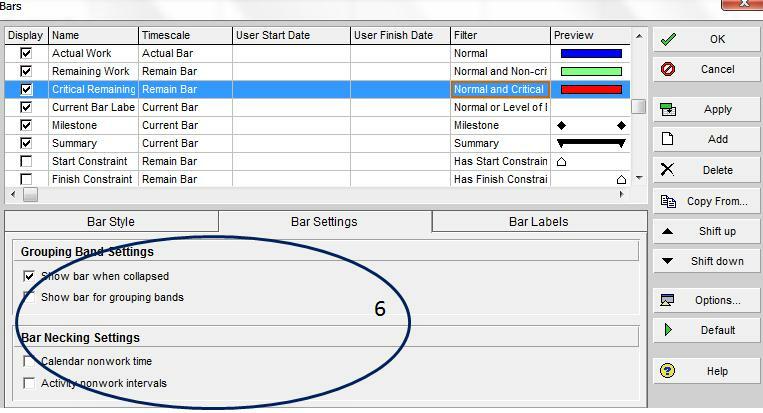 (6) Bar Setting where you can change the appearance of bar by just changing “Grouping Band Setting and Bar Necking Setting. (7) Bar Labels where the customized bar labels can be added. For instance, activity name can be displayed in left or right side of the bar instead of displaying in the activity column. 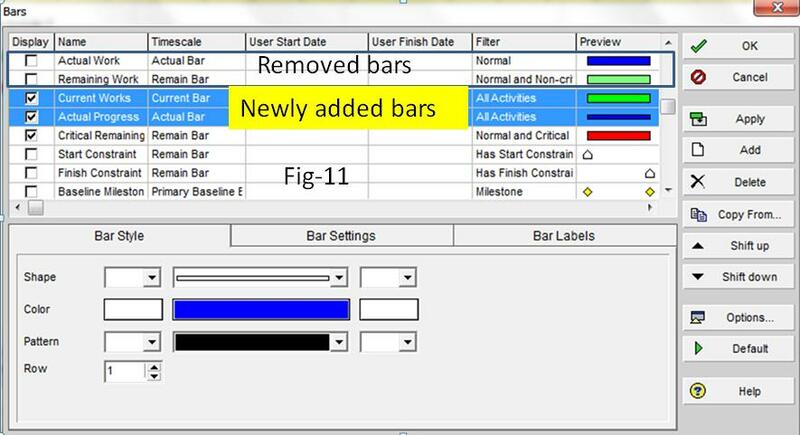 Actual Bar Timescale is selected for actual work (blue bar) and filter is set to Normal which means that any activity got actual progress will be displayed as blue bar. The first portion of activity will be displayed as blue when activity started and the completely became blue when the whole activity has been completed. See “New Activity 2 and 3” in Fig-1 and 2. 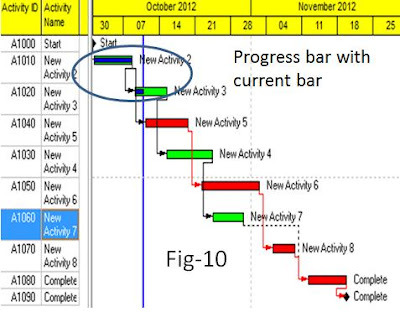 Remaining Bar Timescale is selected for the remaining works (green bar), and Normal and Non-critical activity filters are used. This means any non-critical remaining work will be displayed as green bar. Remaining portion of activity will be shown as green until activity completed. 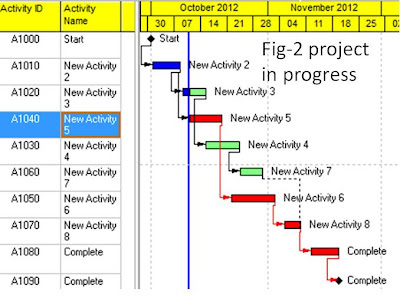 See “New Activity 3, 4 and 7” in Fig-1 and 2. 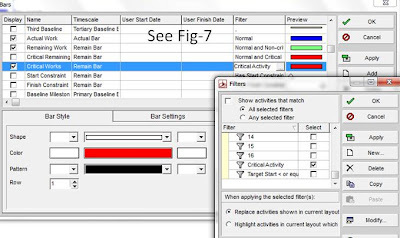 Remaining Bar Timescale is selected for the Critical Remaining work (red bar), and Normal and critical filters are used. This means any critical remaining work will be displayed as red until activity completed. If you know how existing bar works, then customizing of existing bar is easy. (2) Go to bar style tag, and then change the bar style format if you just want to make cosmetic changes. (4) Double click on the filter that you want to make changes. Then, filter box will appear and select the desired filter. Remember the select filter is one of the drivers of bar chart appearance. (5) Change the desired Timescale from the dropdown list. (6) Select “Calendar nonwork time” if you want to display non-working time. 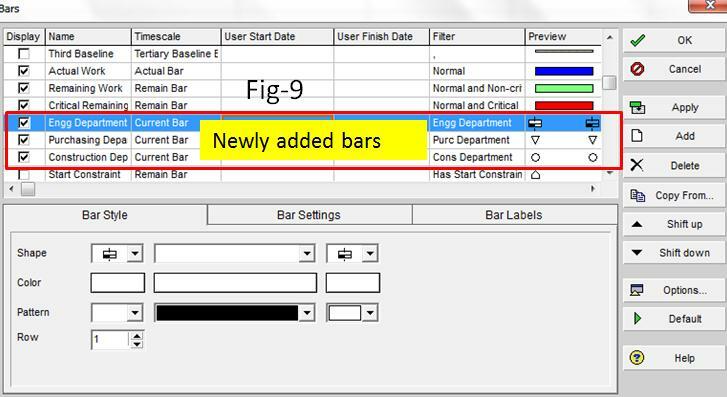 There are endless options to add and display new bars depending on filter criteria, bar style format. You might want to show the bar appearance based on the activity codes or user defines field criteria. Suppose, user defined critical activities needs to be shown in your project. a) Assign user define field code called “critical” for instance, in the selected activities. See fig-6. b) Go to bar dialog window and add new bar. Set the filter that contains critical in Text1. c) Change the desired bar style. In this example, red color is used. Remove the default critical bar. See Fig-7. d) Select the “Remain Bar” Timescale. Using this method, any activity can be highlighted differently from the crowed activities by means of graphical presentation. Suppose activity bars need to be displayed according to activity code “Department” criteria (i.e. engineering, purchasing and construction department ) in addition to default bars. See Fig-8. 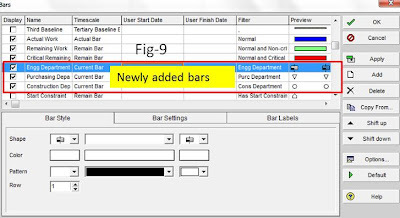 The department bars are displayed while Actual Work Bar, Remaining Work Bar and Critical Work Bar are being displayed. a) Assign activity codes in the selected activities. b) Add the new bars called “engineering”, “purchasing” and “construction department”. Then, change the desired bar style. 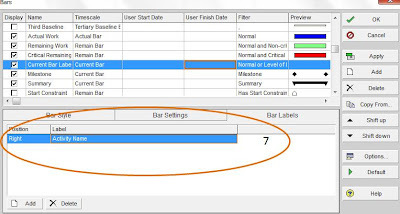 Select the Current Bar Timescale so that it can be displayed all the time. c) Add each filter to each bar. See Fig-9. You might just want to change the bar’s appearance. 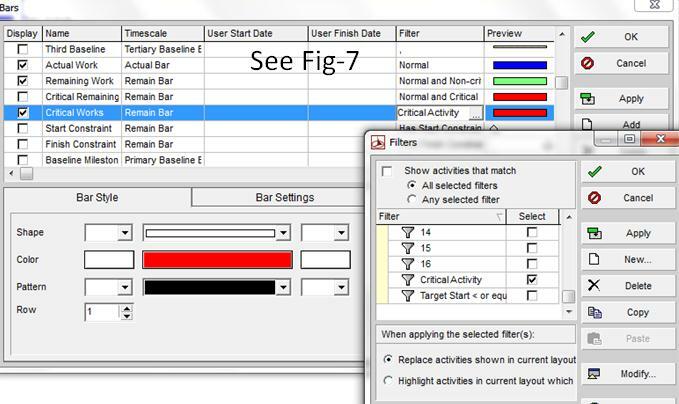 c) Select Current Bar Timescale and set to all activity filter to Current work bar. Finally, you could create hundreds of layouts depending on the filters (activity codes, user define fields) , bar style format color, bar style position and background color and Time Scale selection.